Everything that is new or uncommon raises a pleasure in the imagination, because it fills the soul with an agreeable surprise, gratifies its curiosity, and gives it an idea of which it was not before possessed. This is a quote by the celebrated Joseph Addison. But the delight these lines echo is something you will experience on your visit to the mesmerizing Forts and Palaces of Rajasthan. The mere mention of Rajasthan conjures up images of Forts and Palaces. Famous the world over, Rajasthan is dotted with countless stunning Palaces and massive Forts each having its own history to tell. The fabulous locations where these forts and palaces are nestled give a special flavor to them. Some are perched on high Hills, some amidst the silent desert and others in the middle of the romantic lakes. Although some of the forts and palaces look weather-beaten and rough, the interiors of these can actually fire your imagination with their lavish aura. Soaked in rich heritage of Rajasthan, most of these forts and palaces have now been converted into luxurious Heritage Hotels providing great opportunity to the travelers to savor a royal experience. Come and spend a few days embraced in royalty. 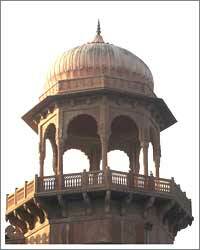 When it comes to tourism attractions, the forts and palaces of Rajasthan are ‘a feather in the cap' of the state. Each establishment has its own unique architectural style and charm. Some of these forts and palaces have bagged international fame for their beauty and royalty. Some of the famed forts and palaces of Rajasthan are Junagarh Fort, Lalgarh Palace, City Palace Jaipur, City Palace Udaipur, and Umaid Bhawan Palace.